Another busy few days of theatergoing, though I did still find time for a quick side-trip to Bath where I was surprised (and a little terrified) by a festival of morris dancing. Those bells will haunt my dreams. Last Thursday, I took the tube Northward to Kilburn to the Tricycle Theater to see Called to Account. In New York, we know the Tricycle best for their production of Guantanamo which played at the Culture Project a couple of years ago. That was only one in a long list of plays the tricycle has produced that combine interviews, speeches, and trial transcripts. Often a collaboration between director Nicolas Kent and Guardian journalist Richard Norton-Taylor, these “tribunal plays” have included stagings of proceedings relating to Nuremberg, Bloody Sunday, and Srebrenica. Called to Account is something of a departure. Subtitled “The Indictment of Anthony Charles Lynton Blair for the Crime of Aggression against Iraq – a Hearing” (Lynton), the play does not make use of trial transcripts precisely as Tony Blair has not been called before the International Criminal Court, nor is such a trial mooted. So the enterprising Tricylce hired a firm of lawyers and asked them to contact cross examine relevant witnesses (advisers, MPs, intelligence officers, etc.). Transcripts from these interviews comprise the play. The prosecution announces it will investigate four points: What was Mr. Blair’s true purpose in using force? When did Mr. Blair commit himself to force? Did Mr. Blair manipulate the presentation of evidence on weapons of mass destruction? What was Mr. Blair’s true state of knowledge as to the legality of use of force? To this end, the prosecution calls various witnesses and has them recollect their own involvement as well as quote from documents such as the Butler inquiry and the leaked Downing St. memo. The defense then offers some cross examination. Actually, the piece begins with a defense witness, a Kurdish astronomer who describes Saddam Hussein’s regime as “a weapon of mass destruction itself.” But he isn’t the most qualified speaker and he’s one of the very few ones defending Blair. Of the 11 witnesses called, at least eight are there to bolster the prosecution. This is likely in line with the feelings of most of the audience (and suggestive of who was most willing to participate in this exercise), but balanced it is not. Essentially, Called to Account is a courtroom drama that doesn’t take place in a courtroom (more of a law office conference center) and isn’t particularly dramatic. 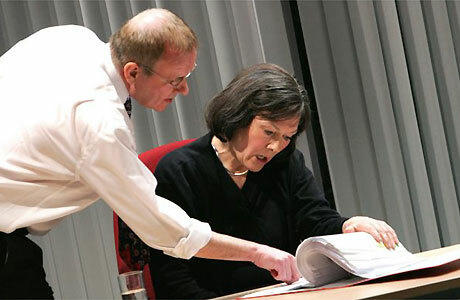 Much of the play consists of characters staring at documents. The attorneys ask them to read highlighted portions and the characters oblige. The facts are fascinating, but not in the least theatrical. The array of documents is quite dizzying, but the action, what little there is, progresses quite slowly. A few of the interviewees emerge as interesting characters (like the MP Clare Short), but few are differentiated. As one might have anticipated, no decision is announced. After some brief closing arguments, the lights abruptly dim and the T.V. monitors display images of a smiling Tony Blair–the insouciant grin itself another accusation.